My mom often prepares Payatham paruppu (aka pasi paruppu) payasam. I love this kheer and I have this as a side dish for chapattis Heard Moong dal kheer is very famous in Kerala! 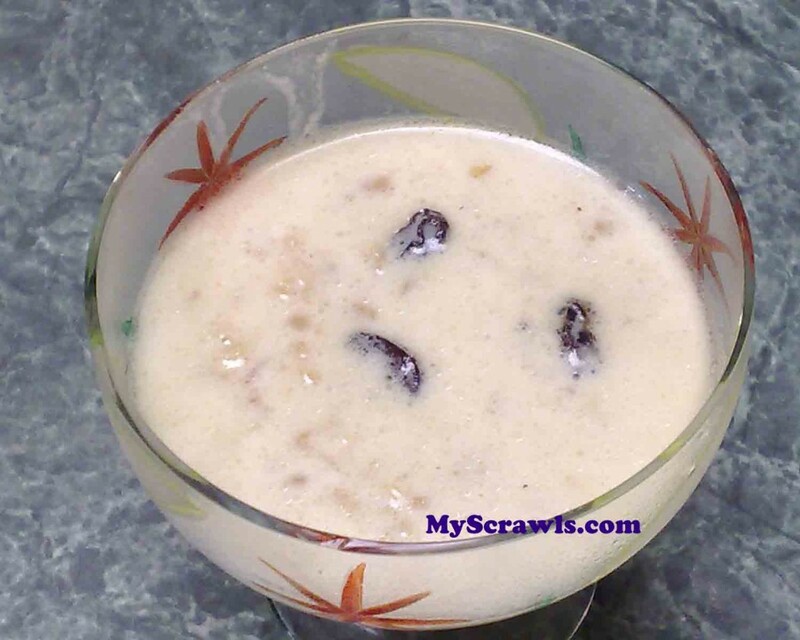 Here is my version of Payatham paruppu payasam. Shallow fry the dal for few mins till it turns slight brownish in color. Boil the milk and add the jaggery. Keep stirring till the jaggery completely dissolves. Now add the cardamom powder and the cooked dal. Allow it to cook for 2-3 mins and remove it from the stove. Heat ghee and fry the cashews and raisins. Add it to the kheer. Serve the kheer hot or cold. Frying the dal is not mandatory. You can also start from step 2. Its my favourite too… But not yet tried it, will try on some special occasions..
Thanx anu for ur lovely comment.Your payasam and mine are same except jaggery.I love to have jaggery but my hubby likes sugar. Wow Saritha, Varunavi is a lovely name S I have heard about adding sugar but have not tried it yet. Will do it some time. Anu, Usha , Sri, Dad: Thans a lot dearies. Nice moong daal kheer. Very simple and healthy yet delicious. Thanks for sharing your recipe! Thanks for the receipr.It is very simple to try but but one question , when the milk & jaggery is mixed the milk turns sour. what is solution to avoid it? Mmmm… sour taste could be due to the jaggery that u had used! I use pale yellow ones available in desi stores.